Mechanical Engineering deals with the the design, construction, and use of machines, and every year thousands of international and EU students choose to study Mechanical Engineering in the UK. It is the most popular branch of engineering, attracting twice as many applicants as other engineering subjects, and is widely regarded as a safe route towards well-paid employment. UK universities provide state-of-the-art facilities, fantastic learning environments and world class teaching which gives graduates the boost they need to start their career. 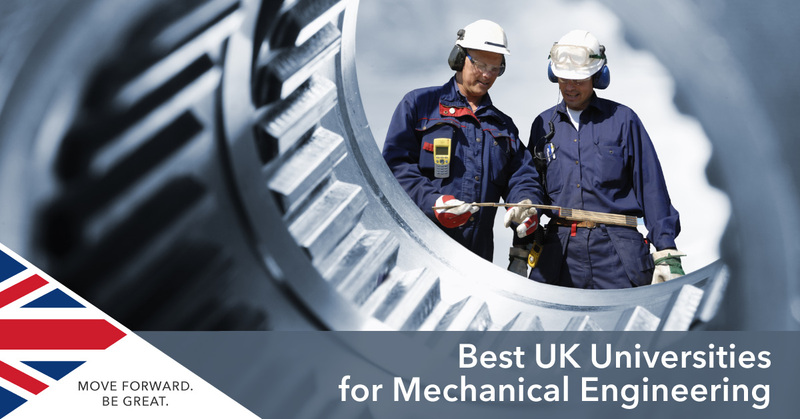 Learn more about the best mechanical engineering schools in the UK below and, if you need help applying for a place on a highly competitive engineering course, arrange a free consultation with SI-UK in London or Manchester today. One of the most renowned universities in the world, Imperial College London’s Mechanical Engineering department is ranked as the best in the UK by the Guardian and second by the Times University Guide. Imperial work continuously with industry to ensure that their courses – and the facilities, and equipment you will learn to use – remain relevant to the profession. The University of Bath Faculty of Engineering and Design has strong industry link and is widely acknowledged for its fantastic research programmes. The University offer MSc in Automotive Engineering, Engineering Design, Innovation and Technology Management, and Mechatronics and MEng courses in mechanical engineering give you advanced engineering knowledge complemented by practical and transferable skills. The University of Leeds Faculty of Engineering won the Queen’s Anniversary Prize in 2009 for services to Engineering and Technology and now offers both BEng and MEng in various branches of the profession. Over 1000 students from over 65 countries study at the mechanical engineering school and its quality of research is second in the UK. The Faculty of Engineering at the University of Bristol is a dynamic environment with around 2,500 undergraduate and 700 postgraduate students. All undergraduate Engineering courses now offer a year in industry as part of the degree and every undergraduate programme offers a year of study at a university abroad. Bristol consistently ranks in the world’s top 100 and the UK’s top 10 universities in league tables. Loughborough University have been teaching engineering programmes since 1909 and, if it is industry experience you are looking for, this School has it. Loughborough send over 15%* more students on engineering placements than any other UK university, and 94% of their students are employed or in further study within 6 months of graduation! Phoebe Mae Rayner, an MEng Electronic and Electrical Engineering student at Loughborough, said of the School: "The teaching is exceptional. Labs are frequent and interesting and we experience using a variety of equipment from the start of the first year onwards." If you are interested in studying Mechanical Engineering in UK, arrange a free consultation in London or Manchester today. More information can also be found with our Engineering subject guide.